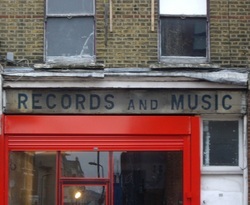 A search on Google Books for 52 Stoke Newington Road reveals it was the headquarters of Sci Fi promoter John Carnell and the ‘International Fantasy Award Committee’; that it sold albums of sound effects; and in the 80s, under the name ‘Phase 3 Records’ , sold Nigerian vinyl. Most recently it was a Turkish TV and video shop. Thanks to John Levin for the Image and text.